Sitting around the Thanksgiving dinner table is the perfect time to ask open-ended questions that can help your children practice gratitude. Answering the basic question, “What are you thankful for?” might be hard for kids at first. Creating a conversation jar can be a fun way to break the ice. These questions make it easy for kids to identify and discover the things and people they really appreciate. In turn, a conversation jar also gives you the chance to inspire by example and express your own gratitude. Use these questions as an example or write your own. What is the best part of being a part of our family? What is one of your favorite memories from a family vacation? What is your favorite thing to do on the weekend or after school? What’s your favorite thing to do with your grandparents, aunts or uncles? What is something someone did to help you today? What’s your favorite thing about dinner tonight? What is your favorite part about living in our town? Who is your best friend in school? Why? What book is your favorite to read before bed? Who is the most generous person you know? Why? 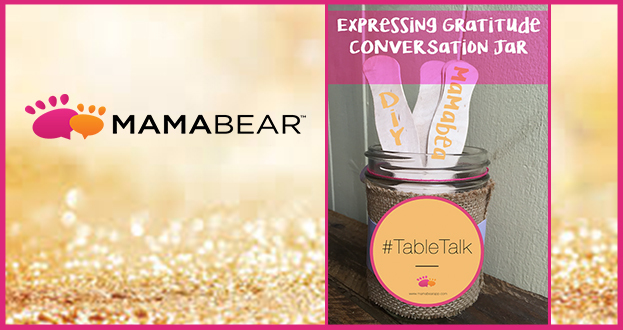 Creating a conversation jar is a fun DIY to craft with your family. Turn these questions into conversations. When your child responds, make sure to point out how lucky they are to have those experiences, items and family members. Point out that not everyone in the world has access those things. Thanksgiving is the perfect time to get kids to talk about what they are thankful for, and help them acknowledge and cultivate a feeling of gratitude and gratefulness. Cut a 4” wide piece of burlap to wrap around the jar. Use a hot glue gun or super glue to attach the burlap to the jar. Cut a 2” wide piece of ribbon to wrap over the burlap. Glue to fasten. Cut out and glue to center of the jar. Or use puffy paint and markers to decorate ribbon. Write your “Gratitude” questions onto the wooden sticks with a marker. Insert sticks into jar, and enjoy engaging Thanksgiving conversation starters with your family!